On the surface, Israeli Prime Minister Benjamin Netanyahu's much-hyped speech on Monday, which revealed new intelligence on Iran's clandestine work to develop nuclear weapons, was an effort to push President Donald Trump to withdraw from the Iran nuclear deal—formally known as the Joint Comprehensive Plan of Action, or JCPOA. Indeed, after unveiling a cache of some 100,000 secret Iranian files that he said Israel obtained recently "in a great intelligence achievement," Netanyahu declared that the 2015 nuclear accord is "terrible," "based on Iranian lies," and "should never have been concluded." The prime minister then noted the May 12 deadline by which time Trump needs to decide whether to re-impose sanctions on Iran and effectively kill the JCPOA, before adding, "I'm sure he'll do the right thing—the right thing for the United States, the right thing for Israel, and the right thing for the peace of the world." The fact that Netanyahu delivered his remarks in English is a clear indicator he was speaking to an international audience. However, Netanyahu's revelations should be understood as more than a simple call for the United States to withdraw from the nuclear deal next week. With his presentation, the prime minister gave Trump a clear path to re-impose sanctions on Iran lifted under the JCPOA by using, not scrapping, the agreement itself. How? As the Washington Institute's Patrick Clawson said Monday, the key is Section T of the deal, which prohibits several "activities which could contribute to the design and development of a nuclear explosive device." Experts have different interpretations of Section T, but there is a strong case that Iran's efforts to preserve troves of secret files on nuclear weapons development plans violate its provisions—and therefore the nuclear deal. Israel's newly obtained intelligence, according to Netanyahu, shows how Tehran "authorized, initiated, and funded" Project Amad, "a comprehensive program to design, build, and test nuclear weapons." While Iran shelved the program in 2003, Netanyahu said Tehran's work in the field has continued, with the regime "secretly storing Project Amad material to use at a time of its choice to develop nuclear weapons." Notably, Netanyahu said the man who led the project, Dr. Mohsen Fakhrizadeh, as well as key personnel who worked under him at the time are still central to Iran's nuclear program today. The International Atomic Energy Agency (IAEA) will need to digest these new files and determine how to proceed, but the United States may decide well before then that Israel's intelligence shows Iran is violating the JCPOA. Section T is just the beginning of this process. The Foundation for Defense of Democracies' Tzvi Kahn has a helpful guide on what would happen next if Washington determines Iran violated the deal. If the United States believes Iran is in violation, it can bring its complaint to the Joint Commission, the body established by the nuclear accord to assess Iran's compliance with its provisions. According to the nuclear deal, if the commission does not resolve the disagreement within 35 days, and if the "complaining participant [the U.S. in this case] deems the issue to constitute significant nonperformance, then that participant could treat the unresolved issue as grounds to cease performing its commitments under the JCPOA in whole or in part." In this situation, the U.S. could then notify the United Nations Security Council that it believes the issue "constitutes significant nonperformance." The council would then vote on a resolution to continue lifting sanctions. If the international body does not adopt the resolution within 30 days of being notified—which would be the case here because the United States, as a permanent member of the Security Council, has the power to veto it—then the old U.N. sanctions on Iran would be re-imposed, or "snapback." Importantly, the nuclear deal notes that Tehran has stated that if sanctions are re-imposed "in whole or in part, Iran will treat that as grounds to cease performing its commitments under this JCPOA in whole or in part." In other words, the deal would be completely dead. So Netanyahu may have indicated he wants Trump to leave the JCPOA next week, but he has also given his American counterpart the ability to achieve the same goal within the confines of the very agreement they both despise. It is unclear whether Washington will pursue this path, but if it does, it must have a clear purpose for doing so. Re-imposing sanctions without a strategic objective will create unnecessary chaos, but if such a move is part of a coordinated strategy with a clear-eyed vision, it may help the Trump administration counter Iran's belligerent activities. 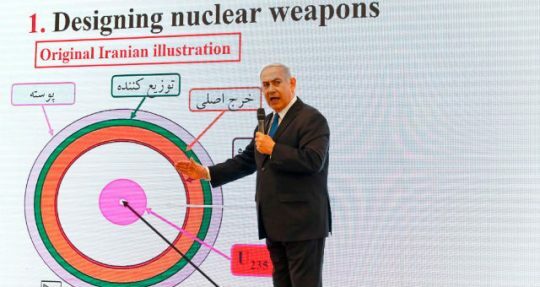 Netanyahu's presentation reveals other issues with the nuclear deal beyond Section T. Many critics of the JCPOA have argued that Iran needs to, but never has, come clean about its past nuclear weapons work—so-called possible military dimensions (PMD) of its nuclear program. They argue that Iran should disclose past weaponization work to establish a baseline for nuclear inspectors to ensure verification, giving them a better idea of what to look for. They also argue that it would force the Iranian government to tell the truth to its people, to whom the regime has lied about the existence of a weapons program for years. However, the IAEA closed its PMD file in December 2015, assessing that Iran undertook work related to nuclear weapons in a coordinated fashion before 2003 and continued some work until 2009, but not as part of a coordinated effort. The organization found no "credible indications" that weapons work continued after then. It is unclear what information in the Iranian files is new, but it will be necessary for Jerusalem, the U.S., the Europeans, and the IAEA to determine what weapons research, if any, is still ongoing with inspections and intelligence. That Iran once ran such an extensive nuclear weapons program while a signatory of the Nuclear Non-Proliferation Treaty is deeply troubling, and it should give the international community renewed motivation to bolster the JCPOA's inspections regime, especially given that the IAEA appears to have been unaware of these files. Iran's leaders have consistently denied ever pursuing a nuclear weapon, claiming their program is for peaceful energy and medical purposes. Netanyahu played clips of many of these statements and juxtaposed them with the contents of the nuclear files to show, quite clearly, that they were lying. "These files conclusively prove that Iran is brazenly lying when it says it never had a nuclear weapons program," said Netanyahu, who argued that the JCPOA was built on Iranian lies. There is no doubt that Iran has egregiously lied about the nature of its nuclear program for years, and this will surely resonate with Trump as he contemplates exiting the deal. Beyond the nuts and bolts of the JCPOA, Netanyahu may have two other reasons for revealing Israel's newly obtained intelligence in such a public fashion. It's possible Netanyahu, who said he had spoken with the leaders of France and Germany and would send experts to share Israel's intelligence, wants to pressure the Europeans to meet more of Trump's demands to fix the deal's flaws in a separate side agreement—at least as a backup plan if Trump decides to waive the sanctions next week. Perhaps most important, though, the prime minister wanted to send a message to Iran. More than an effort to influence policy, Netanyahu's statement was a psychological operation against Iran, effectively telling the regime, "We know where you live, everything that you do, and how you do it." It brings to mind when Israel last month released satellite images showing Iran's military involvement in Syria. The move was meant to expose Iran's malign activities, but also to have a chilling effect on Tehran, to make the regime think twice about acting against Israel because its military and intelligence agencies are watching and ready. In other words, the purpose is deterrence, the bedrock of Israel's defense strategy. Beyond the nuclear deal, Netanyahu is telling Iran, "Don't mess with Israel." Netanyahu accomplished quite a bit with his speech on Monday, despite detractors claiming that he revealed nothing new. Those claims appear to be false, though it will take months to translate and analyze some 100,000 documents in Farsi. One thing is sure now: the future of the Iran nuclear deal is largely in Trump's hands, and he has an important decision to make next week. It is safe to say Netanyahu's remarks will be on his mind as he decides what to do. This entry was posted in National Security and tagged Benjamin Netanyahu, Intelligence, International Atomic Energy Agency, Iran, Iran Nuclear Deal, Israel, Nuclear Weapons, President Trump, Trump Administration. Bookmark the permalink.